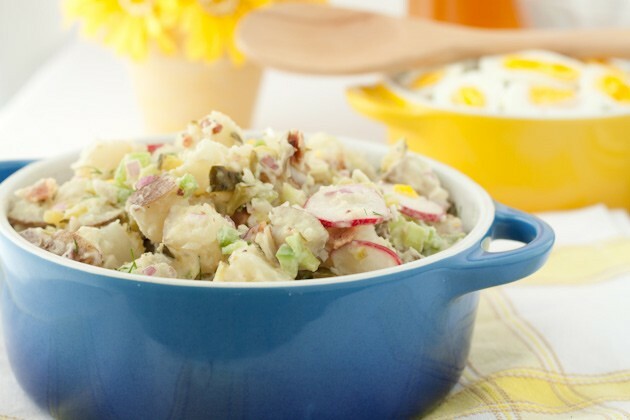 The most delicious potato salad recipe you’ll ever try. The secret’s in the pickle juice! Fill a medium sized saucepan with water, cover, and bring to a boil. Add potatoes and cook until they are fork tender, about 15 minutes. Drain the potatoes and set aside. Meanwhile, cook the bacon in a skillet over medium-low heat until crisp. Remove bacon with a fork and place on a paper towel [or cloth]-lined plate and pat dry. Combine mayo, pickle juice, mustard, dill, herbamare, and pepper in a small bowl and set aside. 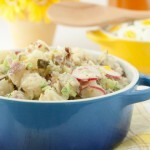 In a large bowl, combine the bacon, celery, pickles, pepper, red onions, and radishes. Pour the dressing over the ingredients and stir to evenly coat. Drop in cooked potatoes and mix gently. Spoon salad into a 1 1/2 qt. or 1.4L casserole dish and top with hard boiled eggs.